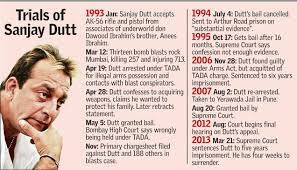 For nearly fourteen years, Sanjay Dutt had to live in suspicion to have been involved in Mumbai blasts of 1993 until on November 28, 2006 he was finally acquitted from all conspiracy charges under TADA. Nevertheless, he was found guilty of illegal possession of arms and, on July 31, 2007, sentenced to six years rigorous imprisonment under Arms Act. The sentence was reduced to five years by the Supreme Court on March 21, 2013. On March 12, 1993, Mumbai was devastated by 12 bomb blasts between 1:33 pm to 3:40 pm that left around 257 people dead and injured another 700. Property worth Rs.30 crore was damaged in the blasts. The blasts severely rocked Bombay Stock Exchange building, Air-India Building at Nariman Point, Worli opposite Century Bazaar, Hotels Sea Rock and Juhu Centaur among other pivotal city points. On April 19, 1993, Police arrested Sanjay Dutt upon his arrival from Mauritius, on the ground that an AK-56 rifle was found in his house which was from the consignment of arms smuggled into India before the blasts. He was arrested for illegal possession of firearms acquired from terrorist acquaintances who were responsible for the blasts. On April 26, 1993, he admitted to the charges in his confession. But later retracted the confession. A TADA court had later sentenced 20 people to life imprisonment and 46 others, including Sanjay Dutt were given varying terms of imprisonment. On May 3, 1993, he was released on bail by the Bombay High Court. On July 4, 1994, Trial court canceled his bail and he was arrested again. On October 16, 1995, after spending nearly 16 months in jail, he again got bail on hearing a letter written by him to the Chief Justice from jail. The letter was converted into a petition. On November 28, 2006, TADA court in Mumbai acquitted him of charges of conspiracy in the 1993 serial blasts framed under TADA Act but convicted him of the lesser crime of possessing arms. On March 21, 2013, Sanjay Dutt’s conviction was upheld, and six year jail term was reduced to 5. There has been a heated debate about his conviction. The pro-sanjay dutt brigade’s logic is clear: he made a mistake,he is innocent and comes from a good family. The powerful political and societal lobby is sympathizing with him and arguing that the sentence is too harsh. He has been convicted under the Arms Act. But his acquittal under TADA remains unexplained. Because under TADA, at that point of time, possessing an illegal weapon in a notified area – which Mumbai was – automatically attracted the stringent act. Press Council of India Chairman, Justice Markandey Katju sent a written appeal to the President of India seeking pardon for Sanjay Dutt. The problem with Justice Katju’s appeal is that it was basically an emotional plea. Coming from him, a former judge of the Supreme Court, it is expected that beyond sentiments, the appeal should had also been legally sound.